Hot Rod Golfing At It's Finest ! Hot Rod Golfing At It's Finest! Many of you who have followed Northwest Classic Auto Mall over the years know the previous owners, Jim and Patsy, who retired to Brookings last year. 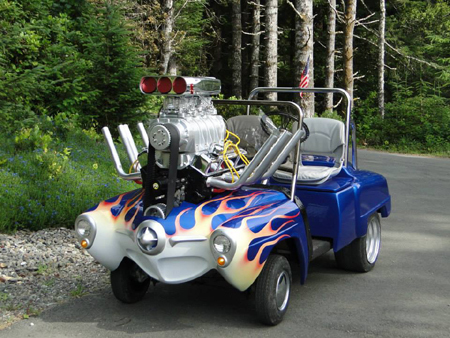 In addition to enjoying relaxing days, beautiful sunset evenings and becoming involved in their local car club, the Curry County Cruisers, Jim has been busy building...well.... this hot rod golf cart! 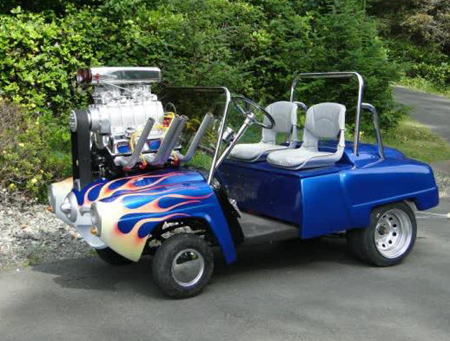 The golf cart engine is a dummy motor and the block and blower are polyurethane. The carburetors are real, but have been gutted out to take away excess weight. The scoop, valve covers, and other engine parts are real as well but non-functional. The cart is powered by 6 six volt batteries, hooked up to a 500 amp laptop programmable controller, which has been set up for maximum torque. There is about 700 pounds of steel welded into the rear of the cart to allow it to do wheelies. It has a Hurst shifter with forward and reverse, stainless steel dashboard, chrome roll bar and windshield frame. The wheelie bars are functional to keep the cart from tipping over backwards. The cart was painted, flamed and graphics added, then clearcoated. Sound bites from the drag strip were downloaded and play on the radio to make the cart sound like it is actually powered by the engine up front. It's a fun toy that gets a lot of attention. When a car guy retires and decides to take up golf, this is a must have!! 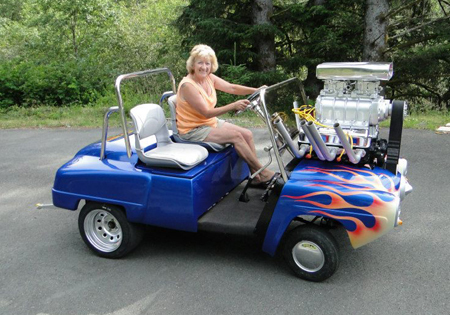 If you would like to see this Hot Rod Golf Cart in person, Jim and Patsy will have it on display at the Southern Oregon Rod & Custom Show in Central Point, Oregon this February 9th & 10th, 2014.